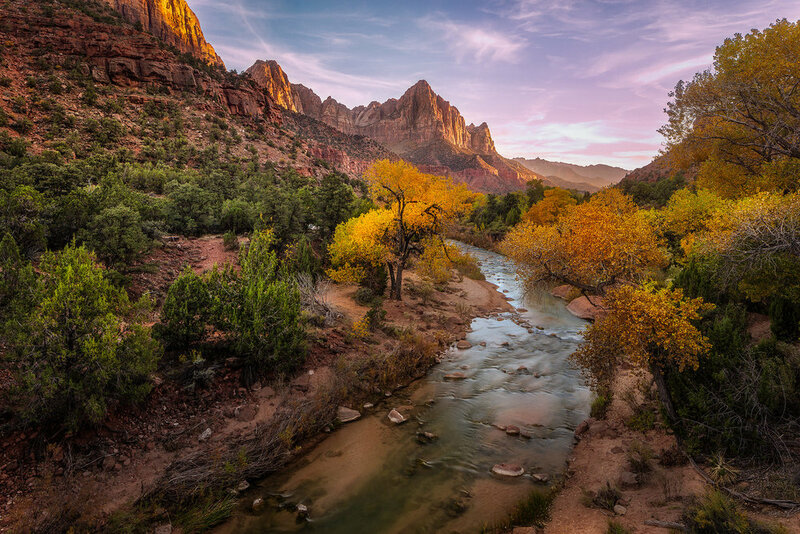 Zion National Park is truly a remarkable place to visit, hike, enjoy nature and to photograph. One of the most recognizable photo locations in the park is The Watchman Overlook. From the Canyon Junction Bridge looking south you are presented with a romantic view of the great southwest like few other places. The Watchman Overlook has many wonderful things going for it: the curving Virgin River leading your eye into the distance, beautiful trees lining the riverbed, a rocky riverbed that creates soft wrinkles in the water, a layered mountain range in the distance with The Watchman watching over the scene. And at sunset (or sunrise) you get the glorious red glow of the Watchman’s cliffs and rosy red clouds in the distance.